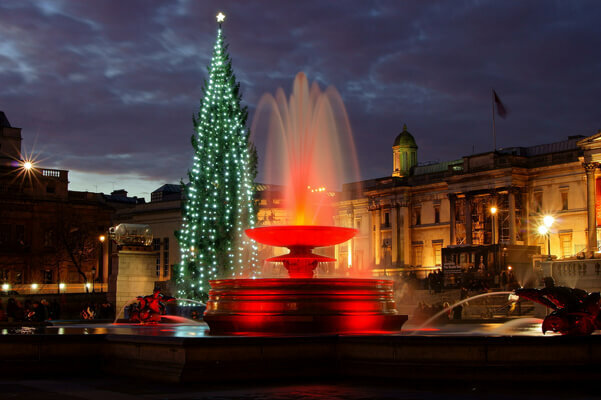 You are sure to experience an incredible festive time with loads of activities and Christmas events in London. The magic in London at Christmas is everywhere to enjoy, from a few reindeers to millions of fairy lights. Admire beautiful modern buildings like the lit up Shard, decorated historical castles and the biggest Christmas trees. 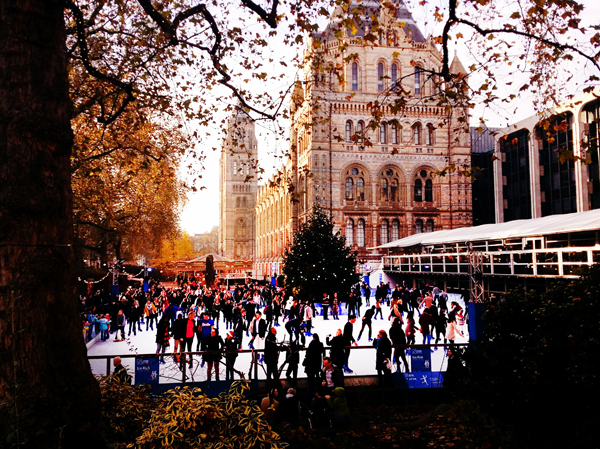 Ice rinks are always a family favourite and of course there is the Christmas shopping! To help you get into the Christmas spirit here is our 12 Christmas events in London guide, detailing some of the best Christmas attractions in London for everyone to enjoy. It will always feel better to give than receive but you can enjoy giving even more if you spend your time finding that perfect Christmas gift at one of London’s amazing markets or shopping streets. There are so many amazing Christmas markets to choose from that we had to create a whole blog post detailing them. Go visit our Top ten London Christmas markets blog post to find out more details on the best Christmas market shopping in London. We would however find ourselves on the naughty list if we did not briefly mention some of our favourites here. 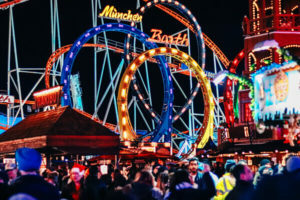 Winter Wonderland in Hyde Park has it’s own section of this blog post below but it does have an amazing Bavarian style market that should be on everyone’s Christmas visiting list. Southbank Centre Winter Market by the River Thames will entice you with sweets and treats from around the world. The Greenwich Christmas Festival is a beautiful market that even Santa has been seen at on occasions. Pear Tree Cafe Christmas Fair is in Battersea Park and during the weekends you can enjoy a boutique market place overlooking the lake. Christmas by the River at London Bridge City overlooks Tower Bridge and the Tower of London and is full of artisan craft creations for Christmas. 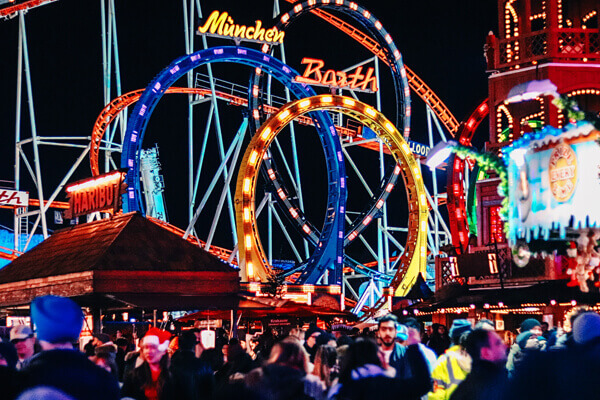 Winterville, like Winter Wonderland, has it’s own section in this blog post and it creates a Christmas market branded Street Feast that will be sure to energise you on those cold winter nights. Christmas in Leicester Square has around 25 stalls set up around the famous Leicester Square, offering traditional Christmas fair. Festive decorations, handcrafted gifts sit alongside food and drink to keep you warm on the cold winter nights. After exploring the market, you can step inside the traditional 1920s Spiegel tent to enjoy a wide range of Christmas entertainment for all ages. Entry to these Christmas markets is free and you can find the opening dates and times on our Christmas markets in London page. 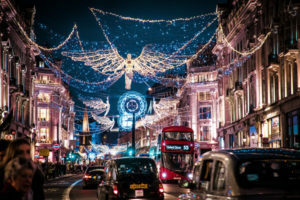 Two of the most famous shopping streets in the world get even better at Christmas with their dazzling Christmas lights creating the perfect Christmas shopping experience. Carnaby Street has also unveiled it’s Queen Bohemian Rhapsody themed lights this year to mark the release of the Queen film in London and it is quite a sight. At times you might have to queue to get inside a shop but at Selfridges on Oxford Street you’ll find yourself waiting to see the beautiful and famous Christmas window displays before going inside. It is hard not to find a shop to spark your creative Christmas gift buying in this area, with a huge choice of big store names and boutiques. Find yourself in Knightsbridge in the evening and you’ll be dazzled by the incredible illuminations of one of London’s most famous stores, Harrods. The iconic store has a giant Christmas shop, offering up Christmas luxuries to break the bank. Santa’s Grotto is a very popular attraction. Even if you don’t want to overspend this Christmas, a visit to Harrods and it’s 300 plus departments is a Christmas experience not to be missed. 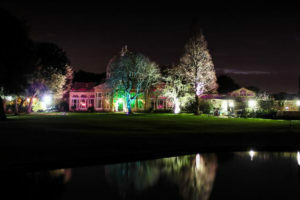 More than 500 years old and home to the Duke of Northumberland and his family, Syon Park in Brentford creates an enchanted woodland every festive season for visitors to explore and enjoy. You’ll need to wrap up warm as this after dark event gives you the opportunity to walk the beautifully lit woodland trail, around the ornamental lake and finish in the magnificent Great Conservatory. Spectacular lighting and the outdoor atmosphere are sure to enchant you and your family. Syon House, Brentford, London TW8 8JF. Open on Fridays, Saturdays and Sundays from 9 November until Sunday 25th November between 5-9pm. Children £5, adults £10 on Fridays, £12 on Saturdays and Sundays. Family rates available on advance bookings. There are plenty of places to go and visit if you’d like to see an impressive and beautifully decorated Christmas tree – for free of course. The most famous of which is the Trafalgar Square tree. Given by Norway since 1947 as a thank you for Britain’s help during the second World War, this world-famous tree stands proudly in Trafalgar Square and is decorated in a Nordic style. Christmas carols are often sung round the tree during the run-up to Christmas Day. St Pancras Station also puts up a huge Christmas tree which is usually one of the prettiest in London. Every day during December you’ll find a choir singing carols by the tree. There will be a host of other trees in London, part of the fun of December is in finding the best ones. Others of note are in Covent Garden, the Connaught Hotel, Claridge’s and by Tower Bridge. 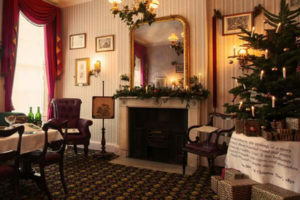 Journey into Christmas past by visiting the Charles Dickens Museum at Christmas. Every year the museum gives a glimpse into a Victorian Christmas. Bedecking the halls with holy and ivy and hidden surprises around every corner. Home to the Christmas Carol, where else can you visit the holiday spirit(s)? Closed on Mondays between January – November except for Bank Holidays and open 7 days a week in December 10am – 5pm. Adult £9.50, children (6-16 years) £4.50 and children under 6 years go free. 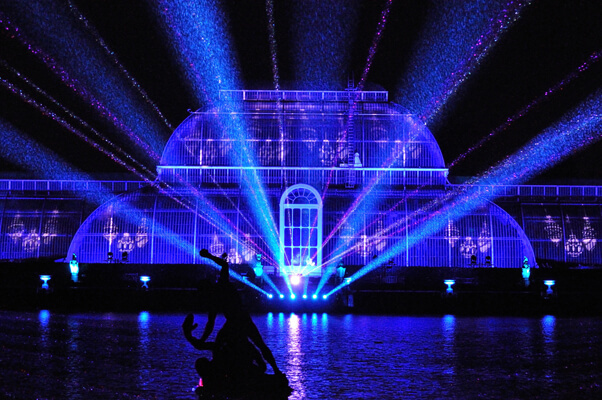 Kew Gardens can take your breath away at any time of the year but when they create their now iconic light show over the Christmas season, things move to another level. 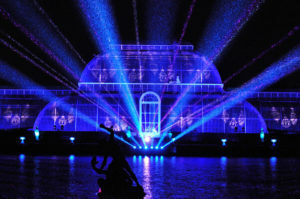 Some of this year’s highlights include 300 glowing origami boats on the lake, over a million dazzling lights, a cathedral of light and a show stopping Palm House finale. This is an art, light and sound show of incredible proportions. Royal Botanic Gardens, Kew, Richmond TW9 3AE. Open from Thursday 22 November 2018 to Saturday 5 January 2019 between 5pm – 10pm. Adults from £16.50, children (4-16 years) from £10. Discounts available for families and Friends of Kew members. With three Royal Palaces to choose from at Christmas you will have a hard time picking your favourite. Hampton Court Palace hosts an amazing Festive Fayre between 07-09 December. At the historic Palace you can sample a huge range of festive food and drink created by artisans and watch live cooking demonstrations. Even join in with the sing along Christmas classics round the bandstand. Additionally, Hampton Court Palace will be filled with Christmas cheer whilst it celebrates ‘Christmas Present, Christmas Past’ from 01 Dec-06 Jan. A new live show will transport visitors back to 1906 whilst the Palace is preparing for Christmas. Singing carols, spooky ghost stories, discovering traditions are all on the menu. Hampton Court Palace, East Molesey, Surrey KT8 9AU. Open 10am – 6pm. Adult £19.20, children (5-15 years) £9.60 and members go free. Book your tickets here to save up to 10% on single tickets and 33% on bundles. Adults from £22.40, children (5-15 years) £11.20. Tower of London will be all Victorian for Christmas between 27-31 December. As well as seeing the Crown jewels, arms and armour and the sinister dungeons you can experience just what a Victorian Christmas would be like at one of the Royal Palaces. The ice rink also makes its welcome return. Tower of London, London, EC3N 4AB. Open Tuesday-Saturday 9am – 5:30pm and Sunday-Monday 10am – 5:30pm. Book your tickets here to save up to 12% on single tickets and 33% on bundles. Adults from £19, children (5-15 years) £9.50. Music, lanterns and decorations will transform Kensington Palace this Christmas. On select dates visitors will be able to meet Queen Victoria and Prince Albert and get an insight into why Christmas was so important for their family. There are family events throughout December including, designing your own decorations, Christmas cards and talks on Christmas presents themselves. Kensington Palace, Kensington Gardens, London W8 4PX. Open Monday-Sunday 10am – 6pm. Book your tickets here to save up to 11%. 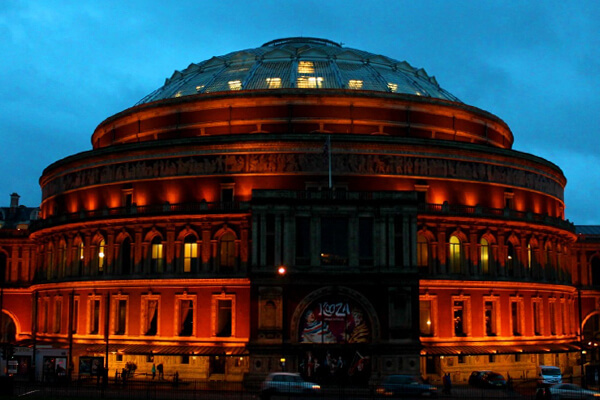 Adults from £17.26, children (up to 15 years) £8.65. Royal Albert Hall has been celebrating Christmas for 147 years now and always has a wide array of entertainment to enjoy. Jazz, Opera, Big Band, Comedy, Theatre, Christmas carols, ballet and even a Charlie Brown at Christmas show. To celebrate the true meaning of Christmas, visit one of London’s many churches and cathedrals to partake in the services and sing traditional carols. 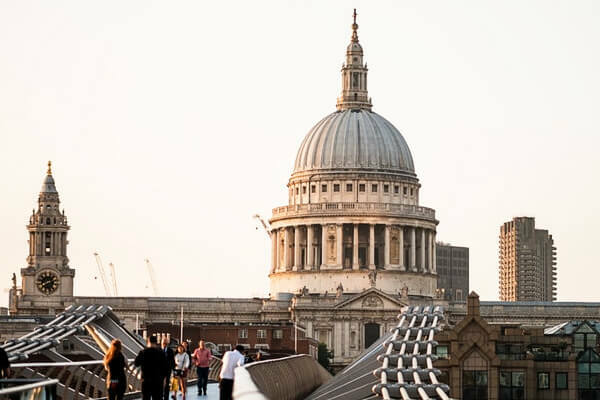 London is full of incredible churches that are sure to welcome you with open arms. St Paul’s is an icon of London and is extra special to visit at Christmas time. 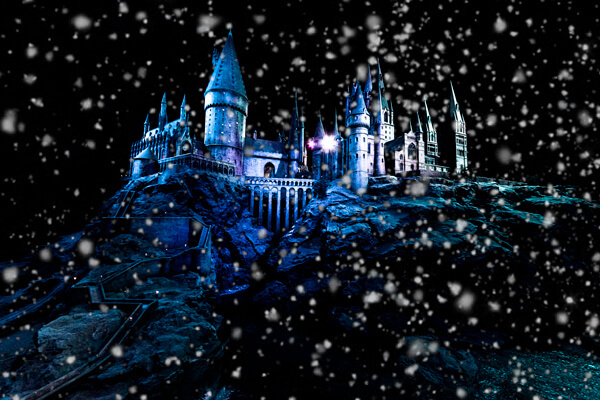 You can experience a magical Christmas at Hogwarts in the snow by visiting the Harry Potter Studio tour this winter. Hogwarts will show you how they made snow and ice that never melts, the Great Hall will be recreated into the iconic Yule Ball, dripping in silver, icicles and snow. 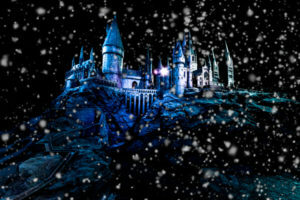 Specific sets of the film will be redressed in Christmas with unique props from the film and even the Hogwarts model will be sprinkled with snow. The kids are sure to love the magic of Christmas alongside the magic of Harry Potter. 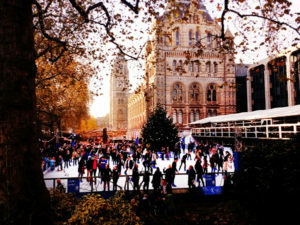 Nothing says Christmas is here more than the appearance of the outdoor ice-skating rinks in London. In recent years London has certainly delivered its fair share of ice rinks for the whole family to enjoy. 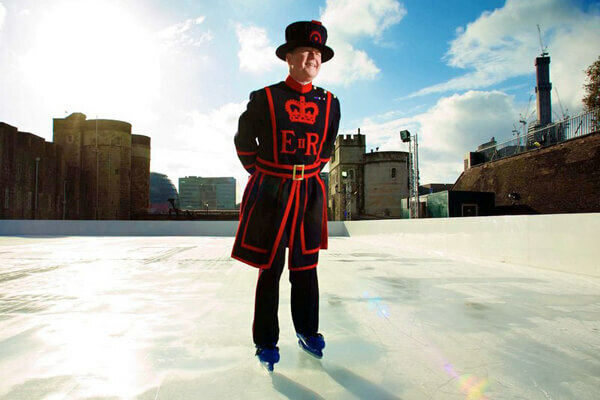 You’ll find a wide range of rinks across the Capital, but some of our favourites include the ice-rink at the Natural History Museum, Somerset House, Canary Wharf, Winterville, Winter Wonderland and Skylight where you can skate up in the stars and delight in views across the London skyline. Winter Wonderland is exactly as its name suggests. It would be hard to list every attraction here as there is so much to do. But new for 2018 are Peter Pan on Ice, Teletubbies Christmas Show, Ice Sculpting workshops, a comedy club and The Snowman Experience, a multi roomed, cinematic walk through experience of the magical ‘The Snowman’ film. The ice rink has grown even bigger and all the old favourites are there such as the circus and rollercoasters. What’s even better is entry into the grounds is free, so there really is no excuse to not visit and enjoy the festive spirit. Winter Wonderland, Hyde Park. Special public preview on Thursday 22 November between 4-10pm, then open every day from Friday 23 November 2018 until Sunday 6 January 2019 between 10am – 10pm, except Christmas Day. Free to enter, paid rides and special attractions. Taking over Clapham Common for five and a half weeks, Winterville offers an ice rink, street food, immersive cinemas, a Christmas maze, roller disco, crazy golf, interactive theatre performances, craft fairs and much more. 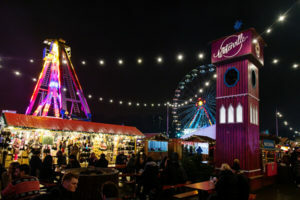 The attractions at Winterville are separately ticketed with advance purchases gaining free entry to the Winterville site. If you do not have a ticket you can still enter the Winterville site starting at £2. Clapham Common, Windmill Dr, London SW4 9DE. Open from Thursday 15 November until Sunday 23 December between 3-10pm in the week, 10am – 10pm at the weekends. Free entry for under 16 years at all times. Adults go free on Tuesdays. £2 on Wednesday, Thursday and Sunday, £2 after 12pm and £5 after 6pm on Friday and Saturday. 13. Christmas at Shrek’s Adventure! 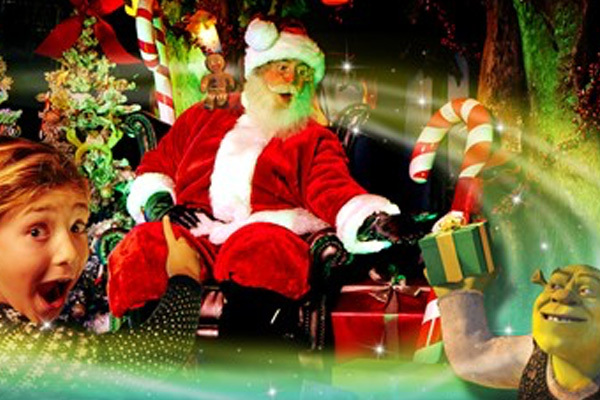 You can meet Santa along with Shrek and his Dreamworks friends this Christmas. Journey through 12 fairytale themed live shows where you’ll meet Shrek and his friends. Then step into the magical swamp where Santa’s grotto awaits. Santa and Shrek all in one place, what could be better for kids this Christmas. For tickets visit: Christmas at Shrek’s adventure! Shrek’s Adventure! London is situated on the South Bank of the River Thames next to the Coca Cola London Eye, opposite the Houses of Parliament. The official postal address is Shrek’s Adventure, Riverside Building, County Hall, Westminster Bridge Road, London SE1 7PB. Open every day 10am-4pm and 10am to 6pm on Saturday, 10am to 5pm on Sundays. Christmas opening times vary so check the site link. Tickets for the Grotto cost an additional £7.50 per child and must be booked for the same day as your Shrek’s Adventure! London ticket. The London Eye has created a Christmas Story entitled Elves Eye View. They are calling young recruits to help Tinsel McJingle, Santa’s Chief London Navigator, and Snowdrop as they become an honouree Elf this Christmas. 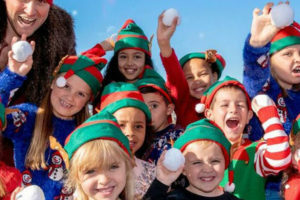 This Christmas experience gives you access to Santa’s Grotto, you’ll learn how to be an Elf and help Santa fly over the skyline, enjoy a guided tour of London by the Chief Elf on the iconic skyline and an Elf hat and certificate to confirm your status as a qualified Elf. Visit Elves Eye View. Elves Eye View costs £35.20. The Coca-Cola London Eye is situated on the South Bank of the river Thames, opposite the Houses of Parliament. The ticket office is located inside County Hall, which is the building directly next to the London Eye. It is open daily 10:45 to 16:45 except Christmas Day. Boxing Day 11:45 to 16:45. New Year’s Eve 10:45 to 13.45. If you have celebrated Christmas Eve late into the night, then a beautiful morning walk should see you set up for the Christmas day ahead. 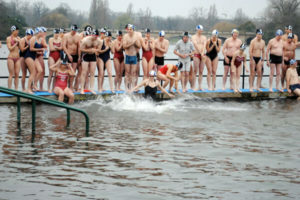 Why not take that walk in Hyde Park and watch the brave souls swim in the Serpentine for the Peter Pan Cup. Started way back in 1864, the Peter Pan Cup was added in 1904 when J.M Barrie author of Peter Pan donated the trophy. 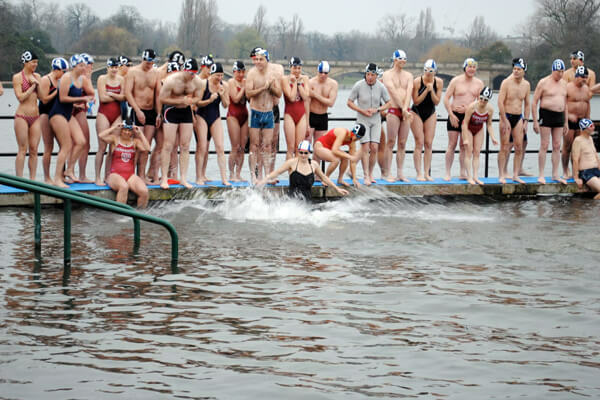 The water will be extremely cold so only qualified swimmers from the Serpentine Swimming Club are allowed in, but you can watch them from 9am and lift their spirits and temperature with some well-earned applause. 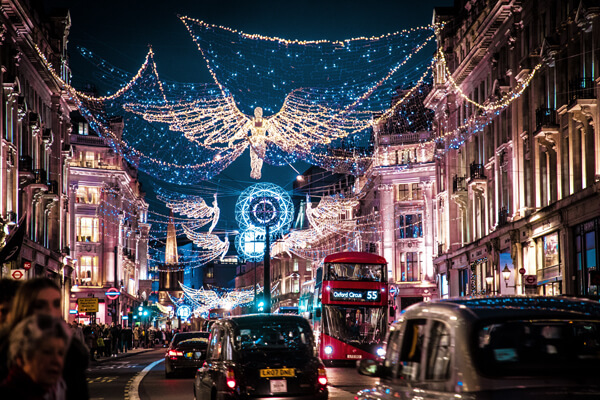 Please do share your experience of Christmas events in London with us at London Toolkit in the comments section. We’d love to hear from you. If you’ve taken any pictures over Christmas just use the hashtag #londontoolkit in your social media feed for a chance to be featured.